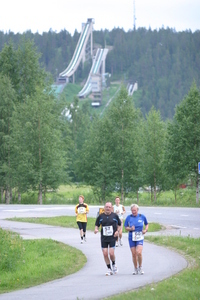 Start is from Santa Claus' Village, where both runners and walkers start together, runners in front of the field. 12km route turns right after Santa Park (2km) along the pedestrian passage towards Rovaniemi. They will ford the River Ounasjoki. In the city central they will arrive to the Festival area, where the finish located. Marathon and half marahton routes turns left after Santa Park and continue downhill for about 5 km. The level section follows the biggest river of Finland, River Kemijoki, for the whole distance. The half and full marathon runners split after the railway-road -bridge as the half marathon runners head towards the Festival area. 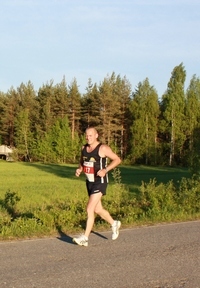 Full marathon runners run to the turningpoint which is located in Paavalniemi, south from Rovaniemi. As they approach finish, their route goes throught Jutajaiset folklore and dancefestival area. Servicepoints are situtated between 3 to 4 kilometres. The whole route is clearly marked and distance covered is expressed by signs situated 1 kilometres apart. This course has been officially measured in the Fall of 2003. Located in the centre of the town, in Lordi's Square. The award ceremony for the runners is in the finish area at 00.00.